When I signed on to teach at the college level–first as an adjunct and now as a full-time instructor–no one told me that every year in May I was going to experience the heart-throbbing pain of good-byes. Don’t get me wrong. I’ve said a lot of good-byes in my life. I grew up as a military kid and we moved a lot, so good-byes were pretty standard fare. I went to high school in Bonn, Germany, at what was then Bonn American High School (Go Crusaders!). 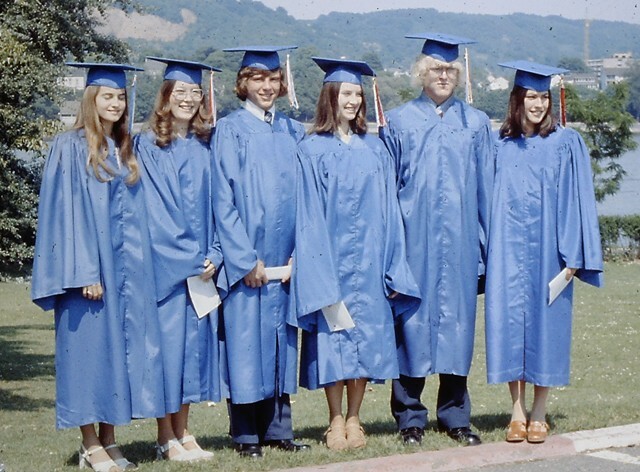 After our class of fifty-some students moved the tassel in 1976, we scattered all over the globe (literally–and I am using literally correctly). Some of my fellow graduates. BAHS 1976. That’s me second from the left. Our tassels were red, white, and blue to commemorate America’s 200th birthday. By the way, that’s the Rhine River behind us. Then, after college, I said good-bye again to dear people who had been my roommates, my suitemates, fellow residence staff, professors, and friends. So no one warned me that now every year I would have to say good-bye to an entire group of students that I had come to love–literally. Students I had watched grow into great writers. Students I had talked to about their future dreams and plans. Students I had prayed for and with, cried with, laughed with. Students who, each year, taught me a little more about myself. This evening we had a dinner to honor our seniors. Yesterday one of them asked that each of the profs in the department provide a letter to all of them, a “last lecture” of sorts. We wrote those letters, and she put them into a packet for each senior. I thought long and hard about my letter. Writing should be easy, right? I’m a writer, right? But what do I say? What words of advice can I possibly give to these young people moving the tassel and scattering to the winds? I told them to expect bittersweet. Graduation has been in their sights for years–but when it comes, it also means good-bye. And that’s hard. It means for the first time in four years they may not know where they will be come August. That can be frightening. I told them to expect loneliness and confusion. Even if life is mapped out, even if there’s a job or grad program waiting and a wedding in the works, there will be times when they will miss the craziness that is dorm life. They’ll wonder if they’re making the right decisions. If they’re still job hunting and spouse hunting, at times the loneliness can be overwhelming. But lest you think I’m Negative Nellie (or maybe just Realistic Rachel), let me assure you, I am all about the positive. I just want them to not think they’re alone when those feelings hit. I also told them to keep the faith. Follow their path and stay close to the God who brought them this far and has a plan. I told them to live this crazy adventure called life to the fullest. I told them to keep writing and to expect rejection (yes, Realistic Rachel, it happens all the time) but to keep writing anyway. I told them to stay in touch with one another and to continue to encourage one another in life and in writing. I told them to find their tribes “out there” and to go to writing conferences just to remember what it’s like to be around a writing community. I told them that they have a gift–the gift of words. Open it, enjoy it, share it, use it. Good-bye, dear seniors. Thanks for being part of my life. Your students are blessed to have had you in their lives. 🙂 Good-byes are always hard. As we know all too well, Linda. Miss you! Linda, I know just how you feel about saying goodbye to your students. I was a teacher in rural Virginia the year you graduated from high school, and those junior high and high school students were like my family. Though I was moving away to get married and teach elsewhere, it was bittersweet to say goodbye. 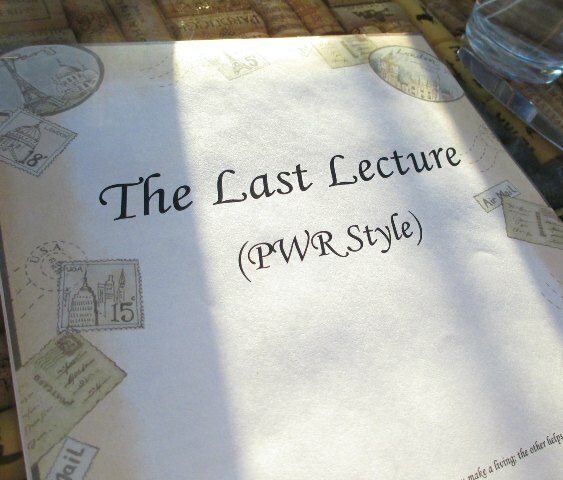 As for writing a “last lecture,” I have established a tradition of doing that for my own kids when they have birthdays. Sometimes I write a long letter, telling them what it was like the day they were born–how their dad got so excited he missed the entrance to the hospital and drove on past, etc., etc., and then fill in details they might never know, had they not heard it from an eyewitness. Other times I comment on character traits in their lives which are outstanding to me. My goal, of course, is to “speak from the grave” someday. When I no longer am here to tell them how much I love them, they’ll have my letters to read and re-read. A fellow Ball State student! Nice. I love the idea of the letter to your kids. So many of those types of memories get lost if they aren’t told and, even better, written down. Your kids are very lucky!